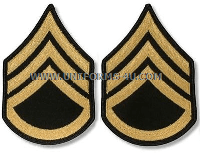 Department of the Army Pamphlet 670-1 requires the sew-on Staff Sergeant chevrons that are worn on the sleeves of the Army Service / Dress Uniform coat and the Blue or White Mess jackets sleeves to be embroidered with golden-light material on a background that matches the color of the sleeve material (Army blue or white). 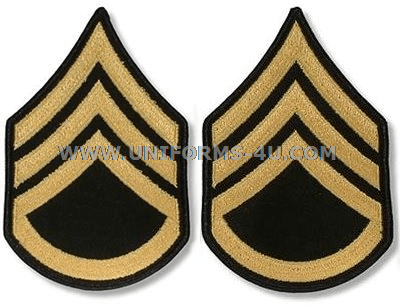 At The Salute Uniforms, we also offer Staff Sergeant chevrons with a green background for wear on the sleeves of the old Class A Army green uniform jackets. 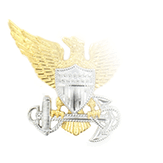 Although the famous “Army Greens” had an official wear-out date of September 31, 2015, it is still a favorite among veterans and uniform collectors, and is of course used in Army-related movies and TV show set during the 50-plus years that it was the primary dress uniform of Army personnel. 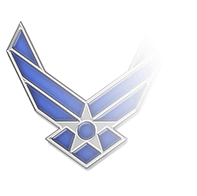 The rank of Staff Sergeant (E-6) was born out of a radical Congressional overhaul of the Army’s pay grade and rank system, one of the major goals of which was to simplify the Army’s bloated and often confusing insignia system. 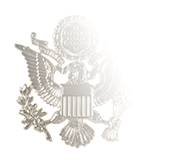 Seven pay grades and seven insignia for enlisted Army personnel were established as a result of the passage of the National Defense Act of 1920; the grades were ranked with the highest (Master Sergeant) being E-1 and the lowest (Private) being E-7 and bereft of an insignia. 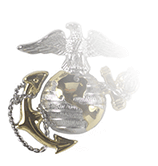 The grade of Staff Sergeant was first established at this time in the grade of E-3; it was outranked only by Master Sergeant and the E-2 grades of First Sergeant and Technical Sergeant. The current system of ascending grade numbers (lowest to highest) was introduced in 1951. 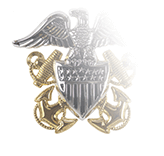 In 1955, the rank of Staff Sergeant was disestablished, but returned in 1958 when the Department of the Army announced the establishment of the E-8 and E-9 grades, with Staff Sergeant being placed in the E-6 grade, where it has remained ever since.